Outdoor special events and sales, including sidewalk and parking lot sales—Allowed only seven (7) times per year, with a maximum event time of 21 days, followed by equal number of "dark days"
Tent sales or events—Allowed only four (4) times per year, with a maximum event time of 21 days, followed by an equal number of "dark days"
Christmas tree lots or pumpkin patches—Christmas tree lots are only allowed between October 1-December 31 of any given year. You may obtain a Temporary Use Permit by contacting City staff at (562) 916-1201. The form is also available as a PDF file at the top of this page. The Temporary Use Permit guidelines file is also available as a PDF, in the Featured Links Section of this page. Your complete application must be received by City staff a minimum of seven (7) business days prior to the start of your event. NO APPLICATIONS WILL BE ACCEPTED THAT DO NOT COMPLY WITH THIS REQUIREMENT. Please note that the event cannot be held without an approved permit. Events held without a valid temporary use permit will be subject to City Code Enforcement action. All applications must include an attached site plan of the proposed use, which clearly details where all related equipment and materials will be placed. If the applicant does not own the property where the event will be held, a letter from the property owner giving their permission to hold the event will be required. Temporary Use Permits may be granted by the City Manager for a period not to exceed six (6) months. Temporary Use Permit requests for projects and events that will last longer than six (6) months must be approved by the City Council. If determined necessary by the City Manager, a public hearing may be held concerning the proposed temporary use. The proposed temporary use must have no detrimental impact on the community or other properties in the vicinity. Conditions of approval designed to uphold the provisions of the Cerritos Municipal Code may be imposed. Such conditions may include, but not be limited to, the posting of a bond to guarantee the restoration of the subject property to its original or otherwise satisfactory condition. All temporary uses will have a specific time limit for removal of the use and restoration of the subject property. A $293 application fee shall be paid to the City of Cerritos at the time the application is submitted. 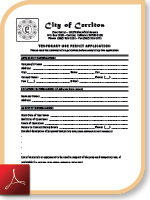 All Temporary Use Permit applications must be accompanied by a site plan of the proposed use. This plan shall be drawn in a legible manner and to a reasonably accurate scale. The plan shall include the location of adjacent streets, relevant buildings or structures, parking and other details, which may be necessary to evaluate the proposed request. The plan shall also clearly indicate the location of equipment, materials or structures to be used in association with the temporary use. Failure to submit a site plan may result in time delays or denial of the application. Certain events, such as those using tents/canopies or serving food, shall require approval from the Los Angeles County Fire Department, Health Department or other outside agencies. These approvals must be submitted to the City with the completed Temporary Use Permit application. Failure to submit these approvals may result in denial of the application. Permit applicants that do not own the property where the temporary use will be held are required to obtain the written approval of the property owner or property manager. Said approval must be submitted to the City with the completed Temporary Use Permit application. Failure to submit this approval will result in denial of the application. Length of Permit: The actual time approved for any given Temporary Use Permit is determined by the City Manager based upon staff recommendation of the below mentioned criteria, the impacts of the particular use, the location of the use and past practices regarding similar events. Conditions of Approval: All conditions of approval imposed by the City Manager on a temporary use are considered binding and will be enforced accordingly. Failure to comply with such conditions constitutes grounds for denial or revocation of the permit and immediate cessation of the event. Said conditions may be enforced by any City official, Code Enforcement staff or the Cerritos Sheriff’s Department. Grand Opening Events: Each business with a physical location in the City of Cerritos is permitted one (1) grand opening celebration. This celebration must occur within 30 calendar days of the date on which the business first opens to the public. Exceptions may be made for re-grand openings involving corporate change of ownership, change of location or substantial remodeling of an existing location. These exceptions will be reviewed on a case-by-case basis by staff and a recommendation will be made accordingly to the City Manager. Seasonal Events: Temporary Use Permits for outdoor pumpkin patches or Christmas tree lots will only be granted between October 1 and December 31 provided the applicant has obtained a City business license. In all cases applicants must comply with applicable Los Angeles County Fire Department regulations and obtain any necessary permits from the City’s Building and Safety Division. Use of Public Address and Other Audio Equipment: Temporary Use Permits may be granted for outdoor events featuring live or amplified music. The proposed activity will be reviewed to determine if it may have any potential impact on adjacent businesses or residents. The Community Development Director will make volume level, speaker orientation and hours of operation recommendations to the City Manager. In addition, a similar review will be completed with regard to the potential need for on-site security or the use of Los Angeles County Sheriffs. Problems or complaints associated with past events will be considered when reviewing requests for new events and may constitute grounds for denial. Should the Sheriff’s Department have to respond to the site for complaints related to excessive noise or other problems associated with the event, the applicant may be required to pay all applicable costs. Outdoor Display and Sales: Temporary Use Permits may also be granted for special sale events, including the outdoor display or sale of merchandise. Approval of a Temporary Use Permit for this type of event, does not under any circumstances, include approval of related signs or banners. The maximum time permitted for such events is 21 days per month with an equivalent amount of “dark” time until the next event. Additionally, an applicant will be permitted a maximum of seven (7) such events within a calendar year. Use of Tents and Canopies: Temporary Use Permits for outdoor sale events or other special promotions/events may include the use of tents and/or canopies. The location, size and material of all tents having an area in excess of 200 square feet or canopies in excess of 400 square feet must be approved by the Los Angeles County Fire Department prior to the submission of the Temporary Use Permit Application. No Temporary Use Permits for tents/canopies will be issued without said approval. All tents/canopies must be solid white in color. Further, all tents/canopies should be located so as not to damage existing on-site landscaping and/or asphalt paving, and cannot impede pedestrian and vehicular traffic circulation. The applicant will also be responsible for obtaining any required building permits if it is determined that such a permit is necessary. Outdoor tents will only be allowed a maximum of four (4) times a year. Cumulative Temporary Use Permits: Permit applicants may apply for one cumulative Temporary Use Permit covering all requested activities throughout a given quarter, six (6) month period or one (1) year period. However, the same limits on the number, type and duration of activities stated elsewhere within these guidelines will still apply. Permit Processing: All Temporary Use Permits must be submitted a minimum of seven (7) working days in advance of the event. Failure to comply with the abovementioned requirements may constitute grounds for denial of the permit. The City's acceptance of a Temporary Use Permit application, including receipt of funds, under no circumstances shall be construed as approval of the event. Final approval for a Temporary Use Permit is not granted until the City has issued the applicant a copy of the signed (by the City Manager or designee) permit along with the associated conditions of approval and plot plan. Under no circumstances is an event allowed to proceed without written approval from the City. Food Services: For any event that will be serving food of any type, a permit is required from the Los Angeles County Department of Health Services. The Department of Health Services requires a permit to be filed for all events that will be serving food in order to insure that the food is properly handled, prepared and stored. The County requires a minimum of thirty (30) days to review and process these permits. Failure to obtain the required food handling and service permits will result in the City's denial of any component of a Temporary Use Permit application that includes food service. Should you have any additional questions regarding Temporary Use Permits, please contact Management Analyst Cynthia Doss, at (562) 916-1201.